"Stay at a Piece of History"
Experience the warmth and hospitality of our 6th generation Pennsylvania German farmhouse, located in Lititz, Lancaster County, in the heart of the Amish Country. Enjoy the innkeeper's intimate knowledge of local history, which was passed down from generation to generation. 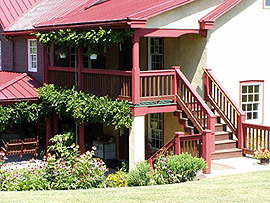 Guests at Coopers Inn enjoy the peace and tranquility or rural life. Take a stroll through the fields to the â€œthree cornerâ€�, the sight of a civil war lookout post. Sitting high on a hillside it offers a 270-degree panoramic view of one of the largest farming belts in Northern Lancaster County. Many of these farms are Amish or Mennonite. 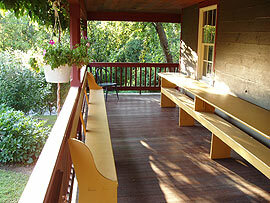 After you walk, relax on the large wrap around porch or perhaps take in the view from the balcony. There is always something to see or hear. Look and listen for finch, swallows, hummingbirds, owls, hawks and an occasional eagle. You might see a rabbit or squirrel sneaking goodies out of the orchard or garden. Quite often the Amish neighbors pass by in their buggies. 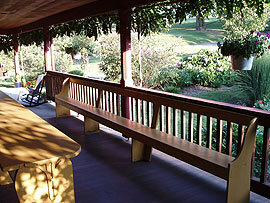 Coopers Inn offers a rural setting surrounded by colorful flower gardens, a fruit orchard and farmland. 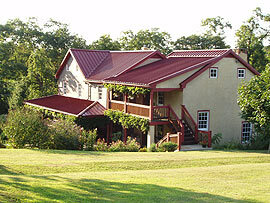 The Inn got its name from the Cooper (barrel) shop located on the north side of the property. Whiskey barrels were made for the local distilleries. Whether you're celebrating an anniversary, birthday, wedding or any special occasion we can help you make your stay memorable. Let us know before hand what your needs are and we will do our best to accommodate. Our B&B features 3 rooms all with private, modern baths, central airconditioning, Wi-Fi , queensized beds, oriental rugs and some antique furnishings.